Updates to Tiwana's profile since your last visit are highlighted in yellow. After graduation I attended North Carolina State University and received a degree in Business. I was a manager with Circuit City for a few years where I met my husband, Frank, the love of my life. After marriage, changed careers and work with IBM as a Contract Auditor. We were blessed with our gifts from God, Frankie 1998 and Jalen 2000. Again I changed careers, "Making Dreams A Reality," for those desiring to purchase homes, as I am now a Real Estate Broker in the Triangle Area. I'm loving life having the flexibility to spend with family and share the gospel every opportunity I get. Tiwana Jones Adams changed her "Now" picture. Tiwana Jones Adams added a photo to her profile gallery. 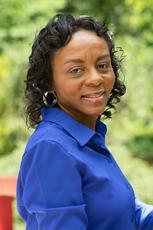 Tiwana Jones Adams has a birthday today. Frankie's 1st day as 5th grader August 25, 2008. Jalen's 1st day as 2nd grader August 25, 2008.